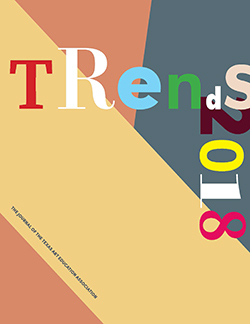 Trends, The Journal of The Texas Art Education Association is published annually and is distributed to all TAEA members at our state conference. The purpose of this peer-reviewed journal is to expand art education discourse by highlighting research, issues, and concerns that can inform our theoretical and pedagogical practices in and out of the classroom. The viewpoints contained in Trends, The Journal of The Texas Art Education Association represent those of the writers and not the Texas Art Education Association. TAEA reserves the right to refuse any submissions based on questions regarding copyright, ethics and/ or inaccuracy. The co-editors reserve the right to edit copy for length without loss of integrity to submitted articles. Please refer to the "Author Guidelines" link for further clarification. Trends 2019 invites essays and artworks that explore and expand the way materiality matters in art education and in and through art. At root we are asking how artists and art teachers attend to the tools and materials that anchor their practices, and how producers and receivers of art pay attention to the material world. For instance, art teacher Nancy Beal has written that materials are as much the teacher as she is. And Mary Hafeli, an art teacher educator, has argued that children "invent ways of working expressively with materials to make artworks" — just as artists do. Working with and being guided by materials resonates with artists across disciplines. The painter Elizabeth Murray said, "I just take my cues from putting the color down and seeing how it works." The poet Wesley McNair said that the poem tells you when it's done. And the woodcarver David Esterly wrote: "In the usual way of thinking, you have ideas, and then you learn technical skill so you can express them. In reality it's often the reverse: skill gives you ideas." In these statements we hear artists and art teachers at the threshold of surprise and the loss of control, where innovation is closer to serendipity than to purposeful design, and where coming face to face with material agency is expected in practice. In our vibrant material world, artistic production often emerges from the liveliness of things. How does this call-and-response serendipity expand art learning? How do art teachers design surprise into lesson plans and facilitate it in their students' artmaking? Trends 2019 welcomes arts-based and text-based submissions. We also welcome research manuscripts that analyze the learning potentials of material practices and how art forms correspond to modes of being, allowing us to visually contemplate and experience ways of interacting in the world. In all categories of submissions we are thinking of materials broadly, including image-making, collage, mixed media, photography, creative writing, performance, walking, listening, collecting, cartography, graphic interventions, and other material encounters. Submissions must follow the 2019 Trends Author Guidelines. Deadline: Original manuscripts must be received by January 15, 2019 as Microsoft Word document attachments. Please submit electronically via email to . For questions or more information, please contact Sean Justice or Rina Little at . Trends, The Journal of the Texas Art Education Association is a refereed professional journal, published annually by the Texas Art Education Association and is sent to all members and to selected state and national officials. The journal accepts articles written by authors residing both inside and outside of the state of Texas. Beal, N., & Miller, G.B. (2001). The art of teaching art to children: In school and at home. New York, NY: Farrar, Strauss & Giroux. Bennet, J. (2010). Vibrant matter. Durham, NC: Duke University Press. Boutet, D. (2012). Metaphors of the mind. Art forms a modes of thinking and ways of being. In E. Barrett & B. Bolt (Eds.). Carnal knowledge: Towards a "new materialism" through the arts. London, England: I.B. Tauris. Esterly, D. (2013). The lost carving: A journey to the heart of making. New York, NY: Penguin Books. Hafeli, M. (2014). Exploring studio materials: Teaching creative art making to children. New York, NY: Oxford University Press. Dear readers, we are delighted that you can now access past issues of Trends. Click here to view past issues of Trends, beginning with March 1957. We are so grateful to Dr. Jack Davis for helping our organization have access to our legacy.